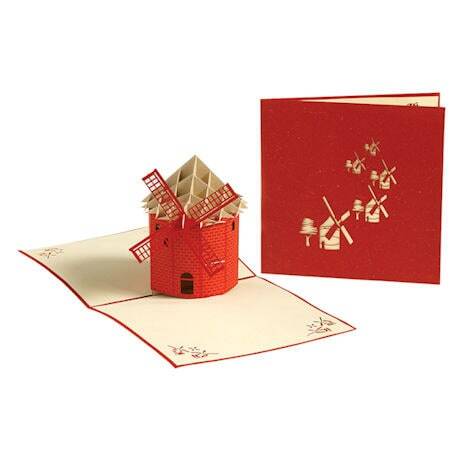 This sparkling crimson card is strewn with silhouettes of pretty windmills all in a row, but inside is where the magic happens: Open the card to reveal an intricate papercraft 3D windmill towering above a field of creamy white. Sold in a set of two, our gorgeous 6"-square card features sturdy construction and an eye-catching design, making it a joy to display! Even the shimmering envelope lets the recipient know they're getting something special as soon as they open their mailbox. Simply write your own greeting on the inside, then mail it off to a loved one for an unexpected surprise!